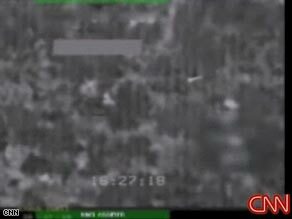 (CNN) -- Grainy video footage released by the U.S. military may not provide a complete picture of what happened in an airstrike that Pakistan says killed 11 of its soldiers, the Pentagon conceded Thursday. The U.S. military says the grainy footage shows how its airstrikes targeted fighters engaged with coalition forces. The U.S. military says the aerial footage, taken from an unmanned drone, depicts a Tuesday attack on guerrilla fighters who were battling coalition troops along the Afghanistan-Pakistan border. An after-the-fact narration repeatedly notes that there are no military structures or outposts within the impact area, and says seven "anti-Afghan forces" were killed on a mountain ridge by precision-guided bombs. But a U.S. Air Force document indicates bombs were dropped on buildings near the border, and Pentagon spokesman Bryan Whitman conceded there may have been another strike that occurred outside the view of the drone's camera. Pakistan's military said its troops were killed at a Frontier Corps outpost near the border town of Gora Prai, and that the outpost was destroyed in the strike. Islamabad called it a "completely unprovoked and cowardly act," and the Pakistani government -- a key ally in the U.S.-led war on terrorism -- summoned U.S. Ambassador Anne Patterson to protest the matter. The U.S. Embassy in Islamabad later released a statement expressing regret over the incident. The Pentagon said the incident remains under investigation, and could not say whether additional videos would be released. A U.S. official with knowledge of the reports told CNN that the airstrike targeted suspected militants who had fled into Pakistan after conducting an ambush on the Afghan side of the border. The official said Pakistani military officials worked with the U.S. forces to track the militants as they fled across the border into Pakistan, and the mission was permitted under the rules of engagement, which allow "hot pursuit" across the border of suspected militants when locations are verified. At a Pentagon news briefing on Wednesday, spokesman Geoff Morrell was grilled about the airstrike and the reported Pakistani military deaths. He stressed that "every indication we have at this point is that this was, indeed, a legitimate strike in defense of our forces after they came under attack." But Pakistan's military had a much different account of what happened. The top spokesman for the Pakistan army, Gen. Athar Abbas, told CNN that the airstrike happened after U.S. forces were called in by Afghan troops who had engaged in a border clash with Taliban forces. The Taliban forces fired on the Afghan troops as they tried to set up a checkpoint in a disputed area along the Afghan-Pakistan border, Abbas said. The Afghan troops then called for help from the U.S.-led coalition forces, which carried out an airstrike on positions where Pakistani frontier corps forces were stationed, Abbas added. Abbas said the airstrike killed 11 Pakistani soldiers, including a high-ranking major, and wounded seven others.